Top seed Alex Robinson (pictured) will meet the 2nd rated Ben Foss in the final. 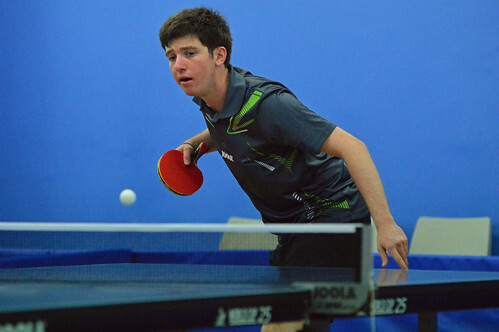 Robinson was in relative cruise control during his route to the final which consisted of straight game wins over Callum Gilson, Joseph Bourgaize and Ryan Bichard. Foss on the other hand faced an almighty scare in his semi final encounter with the younger of the Bichard siblings, Luke. Foss looked to be heading towards a fairly comfortable win whilst leading 3-1, however Bichard battled back well to force a deciding end. Foss held a considerable lead throughout the majority of the decisive leg, however Bichard again fought back to 8-9. Foss earned 2 match points at 10-8 and although he failed to close it out at the first time of asking, he was able to seal the deal on the next to clinch it 11-9. The top seeds and Women's Doubles finalists Chloe Le Tissier and Charlotte Casey will meet in the final. Le Tissier and Casey both experienced comfortable routes to the final, each ending with straight game semi final wins. Le Tissier brushed aside Leah Moore and Casey did likewise during her clash with Daisy Kershaw.